Made of nylon with a crossbar and cord at the top, this dyed flag is great for display in a window. The Service Flag or Banner is displayed by immediate family members of a person serving in the Armed Forces during a period of war. It may be flown below the US Flag on a flagpole although it is more commonly seen as a bannerette hung in a window. 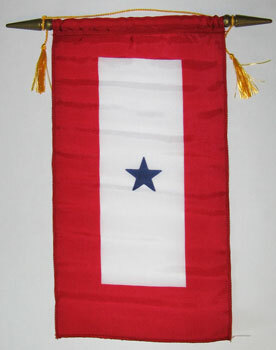 Organizations and businesses may also display the Service Flag if they have members serving in the Armed Forces. Each blue star indicates one family member currently serving in the Armed Forces of the United States. The blue star is covered or replaced with a gold star if the family member is killed or died during the period of war. The gold star then takes the place of honor nearest the staff.